A good grill brush can get most of the grime off your grill after daily use. But once in a while, it’s essential that you bring out the big guns, namely cleaning products. The best grill cleaners are specially formulated to dissolve all the stubborn grease left on the grates and all over your BBQ. If you ask 20 people, they will likely recommend 20 different products. It seems that everyone has their own idea of which is best. So which ones really are the best for a clean and shiny grill? In this article we’re looking at degreasers, soaps and solutions for cleaning, not tools you might want to use. You can check our additional guide for the best grill cleaning tools. But by the end of this article, you should know precisely what to look for in grill cleaning products. We’ll tell you about the different types available, and share our top recommendations for specific products. What Type of Grill Cleaner do You Need? When you’re ready to start shopping for a grill cleaner, you’ll find there is a vast selection available. It’s important to know what the different types of cleaners are, so you’re sure to get exactly the one you need. All-rounders: These are standard products that can be used on pretty much any type of surface. But if your grill grates are coated, this might not be the one to choose. Stainless steel cleaners: Specially formulated to clean grills that have a stainless steel finish. They are softer than others so won’t damage the surface. Soft cleaners: For “lighter” cleaning, where you only need to wipe down with a damp cloth. Heavy duty: As their name suggests, heavy-duty cleaners are for when there’s a stubborn build up of grime and grease. These usually require you to wear gloves, and perhaps even a mask, to keep yourself protected. Now that you understand the various types, it will be easier to choose one that is best suited to your exact requirements. We all have different needs when it comes to cleaning products for our grill. This includes the type of grill we have, how often it’s cleaned, and the surface material. But we also have personal preferences, so we should keep some other points in mind. Some products contain chemicals that are strong enough to scratch surfaces. Others are mild and may even be biodegradable. Surfactants: These ingredients are foaming or cleaning agents that help to remove dirt or grease from grates. Contrary to popular belief, a study has revealed that these aren’t as harmful as we previously thought (source). Solvents: In grill cleaners, these usually include diethylene glycol monobutyl ether or phenoxyisopropanol. D-limonene: This is another solvent you’ll see in some products. D-limonene is a natural agent, derived from various citrus fruits such as lemon, orange, and mandarins (source). pH adjuster: This is important, especially when it comes to degreasers. Some products may even contain two — sodium hydroxide and ethanolamine. There are heavy-duty cleaning products that require you to stay in a well-ventilated room, wear gloves and perhaps a mask. If you don’t follow these safety precautions, you could end up with breathing difficulties or a swollen throat (source). It’s fair to say that these types of products should be kept far away from your food. If you use these on your grill, you’ll need to rinse the grates thoroughly with clean water afterward. If you want to stay safe, look for products containing natural ingredients, such as d-limonene. These have very low toxicity and are relatively safe to consume if small amounts come in contact with the food. Depending on how much time you have, you might want to look for something that is user-friendly. Some products require advance prep, time to work once applied, and perhaps extra equipment. These are not for the busy griller, who prefers something fast and easy. Some people prefer to have one product that you can use on several different surfaces. A multi-use product is one you can bring out to the grill, but will also keep your kitchen appliances looking clean and fresh. Some grill cleaners are scented to leave a fresh aroma after cleaning. Lemon scent seems to be a popular choice for many. Personally, I stay away from scented products. Once again, it’s a case of personal preference. This is perhaps the most important point. Of course, you want something that’s going to succeed in getting the job done. Some grill enthusiasts don’t like to apply cleaning products after every use. If you use cleaning tools regularly, you may only choose to use a grill cleaner occasionally. Although, at that point, you might need something tougher to clear the buildup. Depending on which product you buy, the value is likely to vary. Don’t be fooled into thinking the bigger it is, the longer it will last. Some smaller products are more concentrated and therefore could last longer than larger sprays. Cost is also variable, cheaper doesn’t always mean a poor product. The price may be high because it’s from the grill manufacturer. Generally, though, if there are two size options of a single product, the larger will be better value for money. Now you have an idea of what to look for when choosing the best grill cleaner, read through our recommendations, keeping your personal needs and preferences in mind. How often do you need to clean? Does your grill get really dirty? Do you want something quick and easy, or are you willing to go with a time-consuming process but with a more natural product? With these questions in mind, let’s look at some of the top products available today. This cleaning kit from Weber includes all the essentials for a one-stop shop. In the package, you get a 16-fluid-ounce Weber grill grate cleaner and a 12-fluid-ounce stainless steel polish. Additionally, there’s a 6-ounce stubborn stain remover, exterior grill cleaner, and scrubber pads. Whether you’re a seasoned enthusiast or have just bought your first BBQ, this kit will surely come in handy. You can use it on any type of BBQ or smoker, and even on your kitchen appliances. The grate cleaner will remove the leftover grease on your grates, while the exterior polish will give a new shine to your stainless steel grill. The cleaner spray in this kit is safe and environmentally friendly — no need to wear gloves or a mask. Just spray the solution on cool grates and let it sit for a minute or so. Then use the scrubber to remove the grease and wipe with a damp cloth or paper towel. 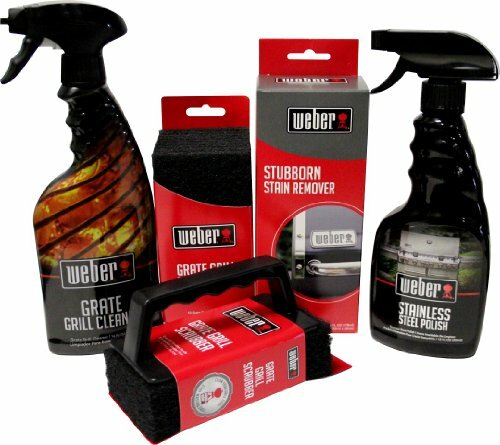 Weber recommends that you wear gloves when using the stainless steel polish and the stubborn stain remover that’s included in this kit. The products do a great job. The cleaner spray is safe and environmentally-friendly. The stubborn stain remover may scratch some surfaces. Products sold by appliance manufacturers can often be more costly. Are you looking to spend a bit less? You certainly don’t want to compromise price for efficiency, which is why this next set is just right. 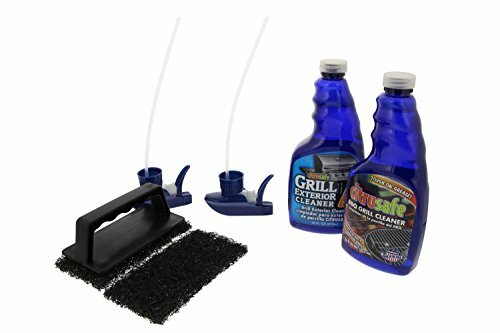 This grill cleaning kit from CitruSafe is the perfect alternative to the Weber set above. In this set, you get two sprays — 16 fluid ounces of BBQ grill cleaner and a 16-fluid-ounce exterior cleaner. To finish off the job, it has heavy-duty scrubber pads with handles. One thing you’ll love about CitruSafe is that the products contain citrus-based d-limonene, which is a natural solvent. This makes their products safe, yet powerful. The CitruSafe company avoids using chemicals such as phosphate, which is a harmful substance if ingested or inhaled in large amounts. Both of the sprays in this kit are non-flammable, so there’s no risk of spontaneous combustion. They also won’t cause any corrosion on your grill, and are biodegradable, so good for the environment. Additionally, the non-toxic sprays will leave a hint of lemon scent after use. CitruSafe recommends that you can use this cleaner on either a gas or charcoal grill. But they also state it’s safe to use on your kitchen oven or microwave. You don’t have to wear protective gear and you can use it on a cold grill. Simply spray some solution on the grates and let it sit for a couple of minutes. Then use the included scrubber to remove the stubborn grease and wipe it off afterward. These sprays are not for heavy-duty work, however. If thick layers of grease and grime cover your grill, don’t expect it to look as new after cleaning. Not good on tough stains. The handle might come loose from the scrubber during hard pressure cleaning. This set of non-toxic sprays is great value. You get safe products that won’t cause you, your grill or the environment any harm. If this is for you, click here to know more. This is the same 16-ounce grill cleaning spray that’s included in the Weber cleaning kit above, sold as a standalone. Toxic products can cause significant harm not only to you but also the people around you. But we still need to remove those stubborn grease stains, don’t we? This grill cleaner spray from Weber will reliably do just that. One key feature I’m sure you’ll appreciate is that it’s a USDA-approved solution. By utilizing the power of citrus fruits, Weber eliminated the need for phosphates, resulting in a non-toxic cleaner. If you like fast-working products, this spray could be for you. And you can also bring it indoors to your kitchen. Reports of bottle leaking or breaking in transit. Not as powerful as some other products. If you need a quick and easy spray to get last week’s grime of the grates, then this spray is for you. Although it’s not for heavy-duty use, it does a thorough job. Learn more by clicking here. Like the Weber cleaner above, this spray cleaner is the stand-alone version of the cleaner included in the Citrusafe kit. This is a solid, reliable product that won’t break the bank. The spray consists of 23 fluid ounces of non-flammable, biodegradable, citrus-based formula. What’s great is you can use it on your grill and in your kitchen without having to wear gloves. It works well, even on stainless steel surfaces. It does have a lemon scent, but this will only give your grill a touch of freshness, and won’t flavor your food. The spray can cut through tough spots of grease, but can’t really be described as heavy duty. It will require some extra effort to remove baked-on food residue. That said, for a safe and efficient product, I would say it’s worth the extra work. You won’t be putting yourself or loved ones in harm’s way when using it. Does require some elbow grease. Being kind to the environment and your own health is essential, and this grill cleaner won’t compromise either one. It’s safe and powerful both for your outdoor cookers and those in your kitchen. Follow this link to learn more. The interior and grates are probably the toughest places to clean on your grill. Finding a product that can get these spots looking fresh without leaving a cloud of chemicals behind isn’t always easy. 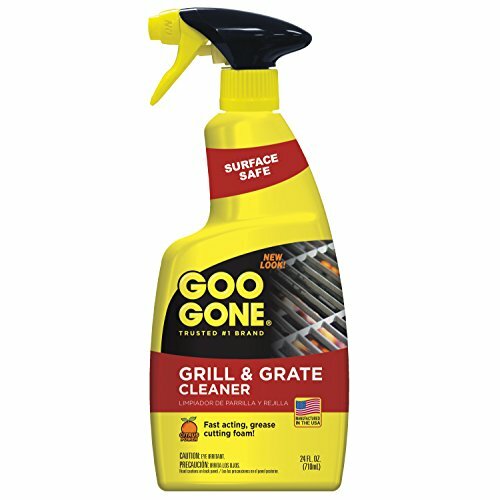 But this grill cleaner from Goo Gone can certainly do the job. In the bottle, you get 24 fluid ounces of formula. The phosphate-free formula works to clean the grates and cooking surface. Spray it on the area after the grill has cooled down, and leave it for several minutes before scrubbing off. Rinse cooking surfaces well before using. It’s environmentally safe, thanks to its biodegradable ingredients. It will reduce smoke and flare-ups by removing most, if not all, the grease in your drip pan. When using it, you’ll notice it has a gel-like texture that will attack the burnt-on grease and residue on your grill. But the gel will also protect the surface from corrosion. This product isn’t officially heavy duty, but it does come close. Goo Gone states that this product is safe on nearly all surfaces. The exceptions are aluminum, cast iron and faux stainless steel. Other than those, you are free to use it on the interior, exterior, grates, drip pan, and kitchen appliances. Additionally, this grill cleaner does not have any strong odors of either chemicals or added scents. However, the instructions caution you to wear protective clothing, when using it. Not a fast working product. For a powerful product that won’t cause harm to the environment, Goo Gone does a good job. It will get most of the stubborn grease off without too much effort, but it will need time to work. If you want to know more, feel free to click here. When grease builds up, and you begin to feel frustrated, it’s time to bring out the big boys. For this, you’ll need a cleaner that will get everything off with little effort. This grill cleaner from Easy Off may just be the one you need. It’s a lot tougher than the products above and is advertised as being heavy duty. In the aerosol spray can, you get 24 ounces of the product. If grease has become your worst nightmare, then you’ll love Easy Off’s grease-cutting solution. You can use this spray on your grill and in your oven. But be mindful of the grates — they will need to be thoroughly washed down with water afterward. This formula is not nearly as safe for the environment as the ones above. But sometimes you gotta fight back when the gunk gets tough. While this is advertised as an everyday product, keep in mind that the fumes can be harsh for the lungs. Be sure to stay in a well-ventilated area and wear a mask when using this product. Spray the formula onto the interior and leave it for five minutes. Don’t forget to put on gloves when it’s time to wipe it off. Once you’re finished, give your grill some time to air out before you start cooking. A heavy-duty product that works. Easy to use – spray, wait, wipe. Works for your grill and oven. Not great for the grates. Can’t be used on a chrome finish or stove top. If you’re looking for a heavy-duty product that will get the grease off your grill, then this is worth a second look. It’s powerful and efficient, so to learn more, click here. Stainless steel surfaces look smooth and clean, but they also require some extra care. For these surfaces, you can’t simply use any product out there, or you’ll risk scratching the coating. Luckily, this Easy Off stainless steel cleaner and polish will keep those sensitive surfaces safe and clean. If your grill is often covered in fingerprints or watermarks, then you’ll love this. It will keep the exterior looking spotless and shiny. Easy Off recommends that you use it on stainless steel surfaces and brushed chrome. However, be careful not to spray it on your grates or areas that your food will touch. There are no odors or fumes to worry about when using it. But you will have to wear gloves. The last bonus that I want to mention is that you can use it anywhere in your home. It works wonderfully in the bathroom and on kitchen appliances. Keeps the surface clean for longer. Not good for greasy surfaces. This cleaner does what it promises without leaving you scrubbing and wiping for days. Click here for further details. Sometimes polishes and cleaners can have a lot of added chemicals. But as we’ve seen, there are environmentally friendly options. 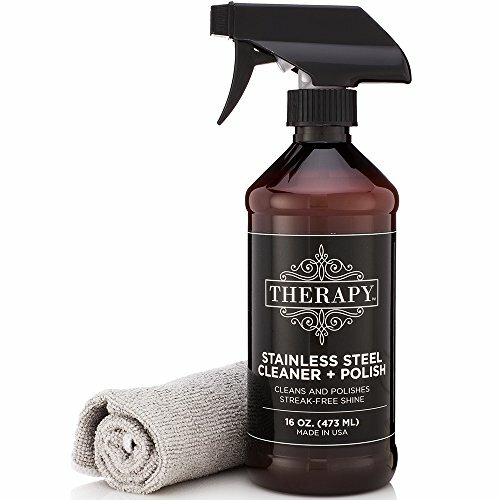 A great example is this premium stainless steel cleaner and polish from Therapy. For starters, the formula is plant-based. In fact, it contains ingredients such as coconut oil and lavender essential oil. The coconut polishes the surface, while the lavender oil leaves a fresh, natural scent. Still, this product shouldn’t be left around children. It does contain substances such as methylisothiazolinone and acrylates copolymer—also typically found in cosmetics. These can be harmful if ingested (source). Fingerprints can be a pain to see on your grill. Fortunately, this formula should repel any greasy fingers from leaving a mark. You can use this product on all types of stainless steel surfaces, be it your grill or refrigerator. To use it, just shake the bottle, spray and wipe with the microfiber cloth included. No need to wear either gloves or masks. Can leave streaks if you apply too much. Natural products can sometimes mean a compromise in effectiveness. However, this product from Therapy seems to do much better than you might expect. You can get some more details here. When your grill becomes covered in soot and burnt pieces of chicken and steak, it’s time to clean it thoroughly. Times like this call for a certain amount of muscle—perhaps even Mr. Muscle? The Mr. Muscle oven and grill cleaner seem to be a favorite among many owners. It’s a strong degreaser and cleaner that will get the smokey films off your BBQ. The can contains 19 ounces of liquid, heavy-duty spray that will readily attack the greasy grime stuck on your grill. If you enjoy having a product that will pretty much do all the work for you, here it is. It’s meant to work fast and easy without the need for too much scrubbing. That said, it’s not for special surfaces such as brushed chrome, stainless steel or aluminum. You should only use it where the grease and burnt buildup sits. And don’t forget to wash your grates thoroughly afterward. There is no scent to the spray, there are fumes. When using it, make sure the area is well ventilated if you’re working indoors, to avoid overexposure to the fumes. Additionally, you should also wear gloves while using this spray. This product is 100 percent chemicals and you don’t want that on your hands. 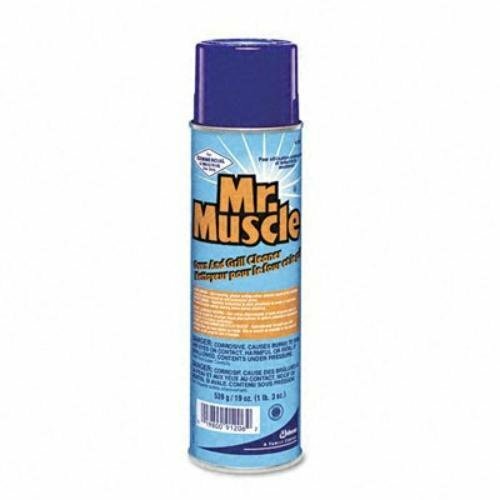 This heavy-duty cleaner from Mr. Muscle is ready to get the worst off your grill. If you think this is for you, follow this link here for more information. Watching your beautiful stainless steel grill become the victim of greasy fingerprints is never fun. The stainless steel polish from CitruShine is definitely one to consider. It does an excellent job at keeping a shiny exterior. You’ll only get 12 fluid ounces, but you don’t need much when using it. Just a quick spray or two, and then wipe it with a paper towel. Remember, one of the things we love about CitruShine is that its products don’t contain many harmful chemicals. And besides removing the streaks and fingerprints, it also contains a pleasant lemon scent. What is more, if you’re looking for a multipurpose polish, this one is fantastic. You can easily use this spray on multiple surfaces. It can be used on window frames, ceramic tile walls, kitchen appliances and of course, grill. This product is also user-friendly. And because of the non-toxic ingredients, you can use it anytime without the need for gloves. If you apply too much it can leave a waxy texture. This polish is easy to use and leaves a subtle lemon scent in the room. Please click here for further information. Finding the best grill cleaner can be a challenge, so keep some key points in mind while searching. These can include which ingredients you prefer (chemical or natural), whether you’d rather have scented or odorless, different uses and, of course, food safety. Here we’ve given you some of the best grill cleaners that stand out for us. Hopefully one of them will be exactly what you’ve been looking for. Got a question? Leave us a comment below, and we’ll make sure to answer it. Don’t forget to share our review with your friends, too!